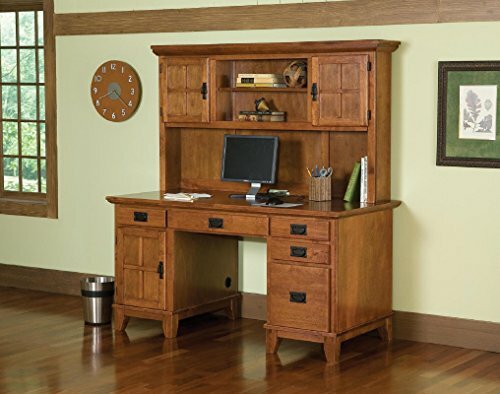 The arts and crafts pedestal desk and hutch is made of solid hardwood. Comes with rich cottage oak finish including clear coat finish helps guard against wear and tear from normal use. It has a practical blend of artistry and utility. Designed for home office use with a left pedestal having a CPU storage cabinet and a box drawer and the right pedestal having two box drawers plus a file drawer. It also features a center, drop-front keyboard tray. The hutch provides extra storage without taking up extra floor space. It has an open area with a fixed and adjustable shelf along with two cabinets, each having an adjustable shelf. Easy to assemble. Measures 58-inch width by 25-inch depth by 63-1/2-inch height. If you have any questions about this product by Home Styles, contact us by completing and submitting the form below. If you are looking for a specif part number, please include it with your message.